RAPAPORT... February is a crucial time for Canada’s diamond mines. Located in the most remote region of the country’s frozen Northwest Territories (NWT), Rio Tinto, Dominion Diamond Mines and De Beers have a two-month window to connect their mining operations to the outside world. The winter ice road, officially known as the Tibbitt to Contwoyto Winter Road (TCWR), opened on February 1, marking the 20th anniversary that the three companies have jointly run the project. The road was first constructed in the 1980s to supply the Lupin gold mine, but Lupin later closed, and the diamond miners took over the project at the start of Canada’s diamond rush in 1999. The route is essential for the miners to transport supplies to their respective Ekati, Diavik and Gahcho Kué mines, which are so isolated employees can only get to work by helicopter. Without it, work in the mines wouldn’t be possible, stresses Ron Near, director of the winter road. Five contractors specializing in engineering, construction, security, safety and dispatch, build the 600 kilometer stretch at an annual cost of CAD 20 million ($15.2 million), Near says. The team of 400 workers began early construction on December 15, clearing the insulating snow from the surface to promote ice growth. The main construction crew joined on January 1, working in a 30-day window to complete the project in time for the opening. Their work isn’t finished now that the road is operating. The workers must continually manipulate the ice to maintain the route for the duration of the project, while monitoring a variety of factors such as truck speed, spacing, and weight. However inconvenient the construction may seem, without it, mining in the area would not be financially feasible. 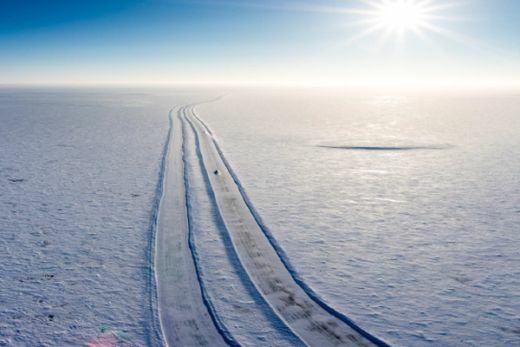 Driving on the ice road can be a dangerous job, as much of the path is built over frozen lakes. A quality-assurance program is set up to manage the rules of the road and ensure the safety of all users, Near explains. A total of 22 security officers monitor the trucks with radar guns to make sure they don’t exceed their maximum speed of 25 kilometers per hour when fully loaded. It takes 14 to 16 hours for trucks carrying nearly 300,000 tonnes of freight to travel the 400 kilometers from Yellowknife to the Ekati mine, he adds. This year, 600 to 800 drivers in more than 8,300 trucks will make the journey to and from the mines, dispatched from Yellowknife every 20 minutes, according to Near. They work in teams of up to four, since the drivers are not allowed to travel the winter road alone and there are three road camps set up along the route to provide drivers with food, bathing facilities and emergency maintenance services. As an incentive, the three companies give out 16 safety awards of CAD 1,500 ($1,138) to deserving drivers every year. To mark the road’s 20th anniversary they’re adding five CAD 5,000 ($3,792) prizes to special drivers nominated by their contractor companies. In addition, each participating mine will donate a diamond that will be awarded to three workers on the project who have shown dedication, support and innovation to make the project safer and better, Near relates.